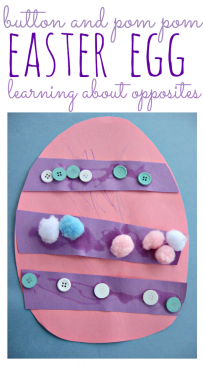 This math craft activity is the perfect example of mixing directed learning and creativity. 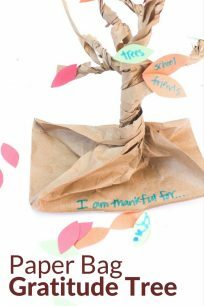 When I create activities like these I try to make them appeal to the kids who love creative art as well as the ones that are excited by the math. 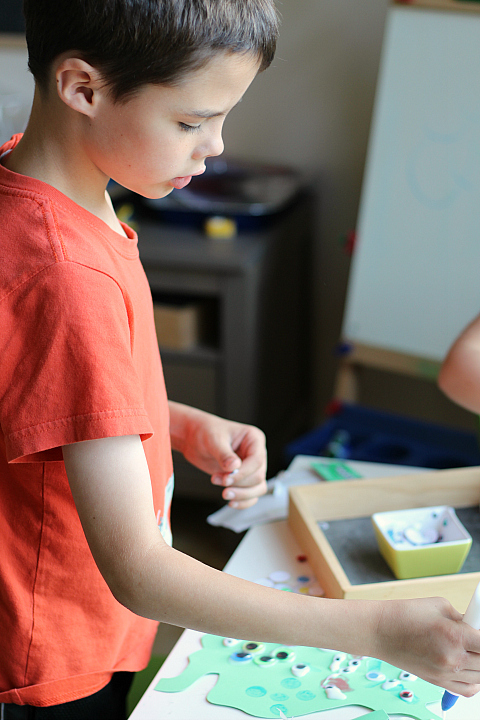 You will find that there is a ton of overlap as well, kids who are into math love art, kids who are great readers love to move, and when we only focus on one way to teach we miss out on so much fun as well as learning. 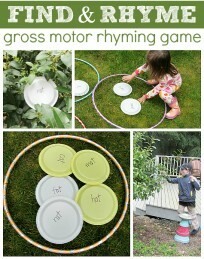 When I created this activity I messed up. My kids were my testers and the activity failed the game test. I tried to make it a game but it was too complicated and I really need to avoid having my kids compete with such a huge age difference. As a craft it was much more fun and we abandoned the game idea a few minutes in. 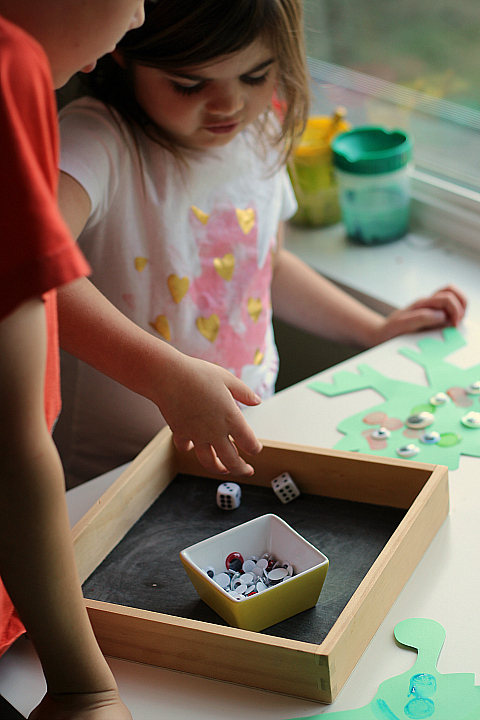 For a simpler and re0usable version of this craft check out our Monster Math Tray, it’s perfect for a small PreK classroom! Gather your materials. 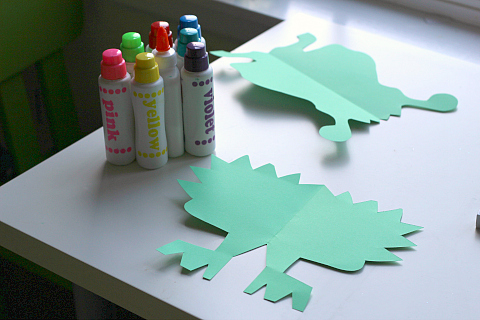 You will need some card stock, some brightly colored paint daubers or markers, scissors, glue, dice, and a ton of googly eyes. Start by folding your card stock in half and cutting out a monster. I just cut our squiggles and spikes and go for it. 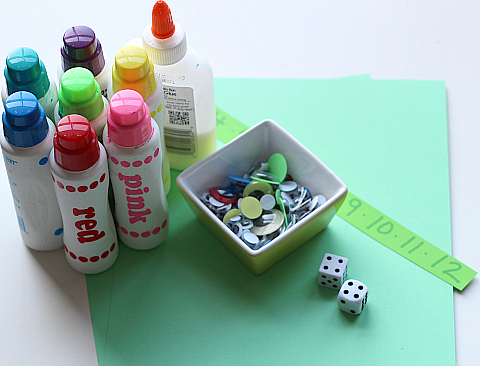 Set out your paint daubers and invite your math whizzes to the table. Let them decorate their monsters with the paint or markers. 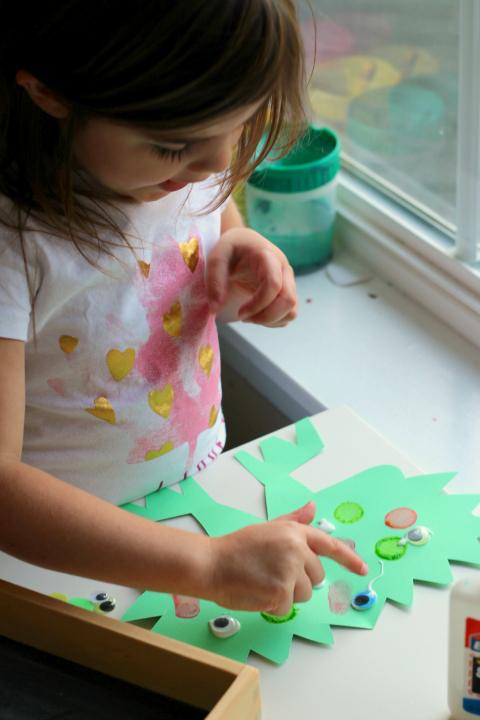 I like using these paint daubers because they dry fast and for this activity that is a must. Markers would be perfect too. 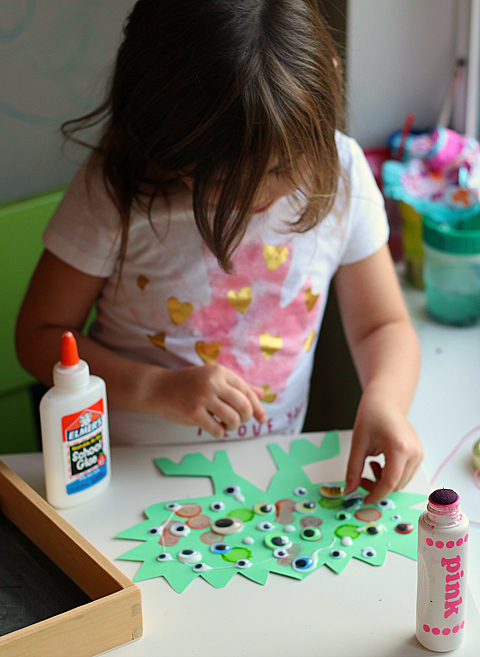 When they are done painting the monster it’s time to introduce the glue ,googly eyes…and dice. 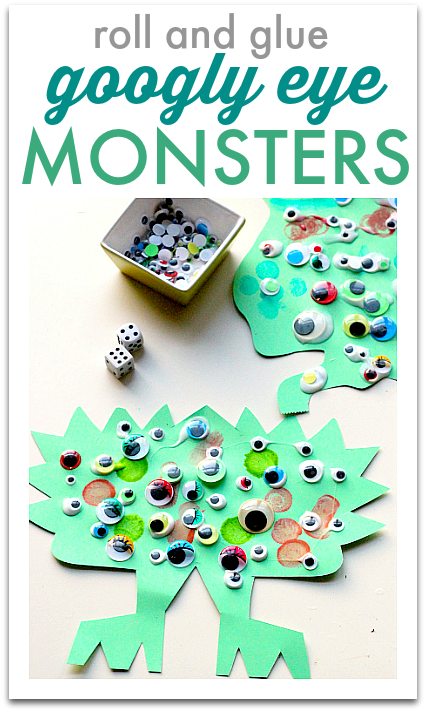 Each creator takes a turn rolling the dice and adds that many eyes to their monster. Only the roller added the eyes on their turn. 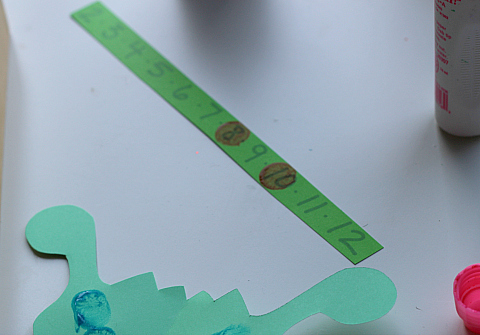 To put a limit on the eyes I had a number line and we blacked out the numbers as they were rolled. If we rolled a blacked out number we rolled again until we rolled one that had not been blacked out. This gave them extra practice subitizing the amounts on the dice and adding as well as adding a team element to trying to black out the number line. Hearing them say ” Come on roll a 6, we need a six.” is not really ground breaking but little instances likes these add up and build teamwork that all families can use. They rolled a lot of the high numbers first… and then we could not roll a 2 to save our lives! My 4 year old suggested ” Just use one die instead it will be easier.” Now here’s the thing, The point of the two dice were to provide more opportunities to subitize, and add larger amounts but I couldn’t just ignore that at 4 she was busting out some awesome logic and I wanted to support that. So we put away one die and kept rolling until we got our last number we needed. 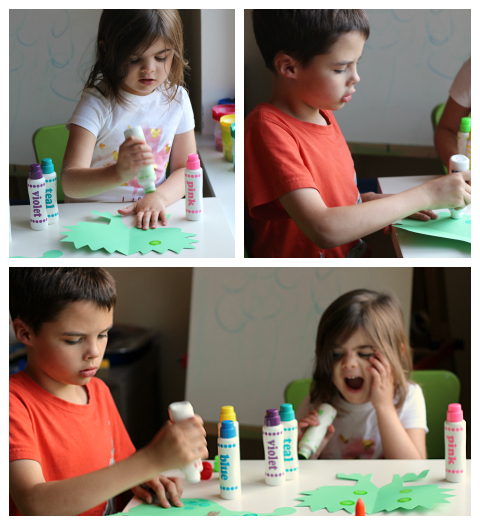 Let the monsters dry and enjoy the fun math monster! I LOVE this! And the number line is just genius, can’t wait to try with my kiddos! Thank you for the inspiration! Love this! My daughter can’t ever get enough googly eyes. And add math into the mix? Perfect. This was a fun project. 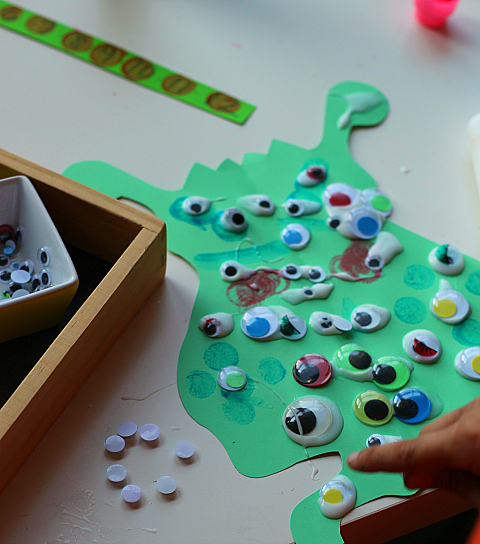 I did it with my Pre-k 4, who just had to identify the number written on it and glue that many eyes. My kindergarten class had an addition problem and had to glue eyes equal to the answer. My 1st grades solved substraction problem to glue eyes and my 2nd graders had a multiplication problem for their number of eyes. Thank you for the idea. Loved it.